VisualCAM for SOLIDWORKS® is based on our industry leading VisualCAM software that is fully integrated in SOLIDWORKS 2010 thru 2019. From simple 2-1/2 axis to full 5-axis indexed milling, VisualCAM for SOLIDWORKS will help you make parts, fast. VisualCAM includes modules for MILL, TURN, NEST, and ART to address specific needs of various CNC manufacturing processes. 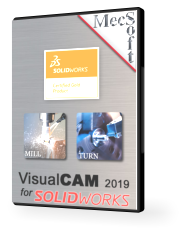 The VisualCAM-TURN module in VisualCAM-TURN 2019 for SOLIDWORKS is used to program 2-axis CNC turning centers or lathes. Includes powerful 2 Axis turning machining methods to handle complex programming tasks. Just as in VisualMILL, the easy interface, allows a user to machine a part in very short time. One of the best value packed lathe products available today. For a complete feature list of each of the configurations, please visit the product page in our main site. Annual Maintenance Subscription provides certain benefits to the customer. Please click here for a full description of what this program offers.